List your genre(s). I can't tell you how many twitter and facebook profiles I read that said they were a writer or aspiring author, but didn't list genre. I love a lot of genres but there are some I'm simply not interested in. So if you write something I'm not interested in, me following you isn't going to help either of us. You'll get that cool notification and that's it. I'll never click on anything you post and I'll never buy your book. Links. Let's say you write SFF. Sweet! I'm interested. And maybe I like some other things about your profile. What now? Give me a website or something to click. There is nothing more frustrating than looking at someone's profile, which indicates that I'm already interested, and then not finding anywhere else to go from Twitter. And know where you want to funnel potential readers, because I'll probably only click one link and you'll be lucky if I click another link on from that first landing page. Like, I might link my SFF chapbook, Premeditations, and my PB Charlie Cat Does NOT Like Halloween, and my Readers Club newsletter,. Examples. If you have product to sell (such as books) I want to see examples of what you've written. I don't mean that I expect thousands of words for free, but come on, give me something. Be proud of your work and let it speak for you. And if possible, have your example link directly to your email list or a book you want us to buy. Images. You have about 30 seconds to catch a potential follower's attention. I saw all sorts of images; most of you had an author photo, which helps with professionalism. Some had covers on their back splash which often helped indicate genre. Some had cool photos which give a peak into that 'I swear I'm a real person' stuff (appropriate for Twitter if not facebook and goodreads). Some had more generic images of book shelves. What caught my eye were the bad images. The ones that were pixelated and a few that didn't have images at all (which is better than a bad image). Generic didn't bother me but bad did. These are social media websites that make it easy for you to add images. Add high-quality images that say something about you. Your Personal Life. Unlike in a short story cover letter, I like to see that tiny bit of you that says hey, you're a real person! Oh my gosh, are we both moms who like SFF? I just clicked follow. You like Star Trek, too? I'm a sucker. I clicked Follow. And as much as I like the witty profile descriptions, that description had better also say something about who you are (or at least your genre!). Adjust this advice for different platforms, but it works for twitter, which is a mix of professional and personal and has low-risk for following new people. Interact. So, I get that people hate those auto-DMs and even Twitter officially discourages it. But I'll admit to clicking on a few of the links sent to me this way--Now I'm not saying that you should break Twitter's rules, but I am saying that you should interact with the people who are your target audience or otherwise have a lot in common with you. There were also plenty of auto-DMs that I did not click on because, wow, you can't reach me if I'm not even your target audience. Twitter in particular is a platform where people expect a lot of short, quick interactions. Even though I found you on a list of 300+ NaNo bloggers, we might actually like talking to each other, yanno? Plus, you joining the blog hop tells me that you're open to almost-random contacts from everyone else on the list. /Advice from a social butterfly. Pick a Platform. What I mean here is to know what you can handle. Don't join every platform in existence without even knowing what that platform is good for. Exceptions might include Goodreads and Facebook, where having your book/author page up is good and interacting is even better but not really required. So don't reach out through DMs and whatnot using a platform that you're not going to stick with. Pick a few that work for you and make it clear where fans can best interact with you. I know an author who periodically has to remind her followers that a FB DM to her is a sure waste of your time, but she still finds Facebook useful because it's Facebook and she does interact on her author page. I didn't follow a lot of the FB profiles because I actually use Facebook for a lot of real-life things and don't need heaps of extra notifications. I have a Goodreads account and a Reddit account that I mostly neglect. Oops. So, for the record, I'd love to connect with you through Twitter, Facebook, and my Readers Club newsletter. Media Sheets. Do yourself a favor and create a media sheet for anything you publish. A media sheet is a document that lists all those annoying things that you have to look up or write all over again when advertising your work, yourself, and otherwise engaging your social media superpowers. For example, amazon link, goodreads link, links to all your social media platforms, small versions of the cover, the blurb, your author blurb, pre-written tweets, etc. My media sheets made my life tons easier as I was filling out the blog hop and responding to new followers. Schedule Posts. As a creative person I often cycle through productive periods. For instance, NaNo meant that I was writing 50k+ words in my WIP, but of course I have to toil more before I can show that to my readers. Then I'll go through periods where I'm writing blog posts because I have an idea or because something timely is coming up. Rather than posting 20 blog posts in a week and then nothing for 6 months, I like to schedule these posts ahead of time and I use fancy magic to automatically tweet my blog posts and share them to facebook. 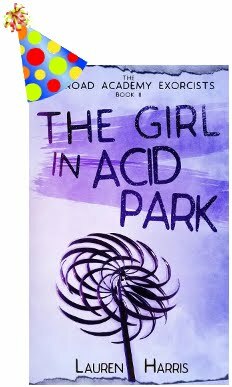 And for advertising my books, I like to have a reason to advertise and I definitely don't want to spam followers every day, so I take something like Premeditiations bookversary and do something special for my Readers Club subscribers. Then there's my Charlie Cat picture book series which centers around certain holidays, so obviously that has a time factor to it. And here I am going back to my media sheets to embed links in this post. Whew! Go Back to Writing! Ever heard the 80/20 rule? Spend most of your time writing, not gleefully making hundreds of maybe-friends on social media. It was fun to participate in the blog hop and I 'met' quite a number of people I'm happy to have in my networks, but it meant that I spent less time writing and now I've got to get back to that. Buh-bye! Sign up for more of Lauren B. Harris' fiction! Sign up for more of my fiction! Everyone loves a book birthday! A year ago today, both Premeditations and The Girl in Acid Park debuted! Happy Book Birthday, Lauren Harris! Books make great holiday gifts! Or maybe you'd like to gift yourself with something to read over the holidays. 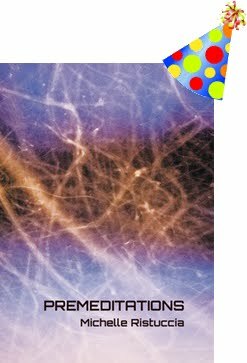 Get Premeditations on your kindle for $2.99! 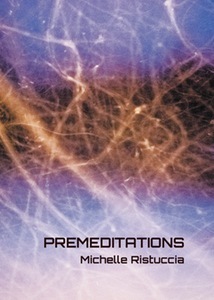 Or get a signed copy of Premeditations directly from me! Your support means a lot. Thank you. Wow, am I enjoying this blog hop already! I'm "meeting" at lot of new people and already seeing many that I have a connection with through fandom, favorite genres to read and write, and parenthood. Follow me on Facebook for somewhat more noise, such as my reviews, and add me on twitter for much more noise, including retweeting my favorite authors and random things about kids. And don't forget to tell me a little about yourself! With all the new people I'm meeting, I'd hate to lose you in the crowd. If you've read this far, I bet we have something in common, so leave a comment or tweet me! I’m excited to share a wonderful Christian fantasy trilogy by homeschool graduate Rachel Starr Thomson. In other words, as a second-generation homeschooler and a Christian and a speculative fiction lover, I am THE market for this book. However, as a voracious reader and long-time reviewer of speculative fiction, I am also very picky. It is rare for me to find a series that both meets my high expectations and gives kudos to Christianity and homeschooling. Worlds Unseen (The Seventh World Trilogy Book 1) by Rachel Starr Thomson is a story of darkness versus the light. It’s good versus bad, and I’m happy to see archetypes and imagery reminiscent of Celtic and medieval fairy tales. Maggie Sheffield begins as a subtly weak character, often being saved by other characters and never the first one to speak up or take that leap. Halfway through the narrative she reaches an epiphany and becomes a purposeful, strong character. Her actions early in the novel hint at this potential - she is the one who offers to take on a dangerous mission, and we know early on that she is no stranger to adventure/trauma. Worlds Unseen is a great epic fantasy read for adults (and young adults) who enjoyed C. S. Lewis’ Chronicles of Narnia as a kid. 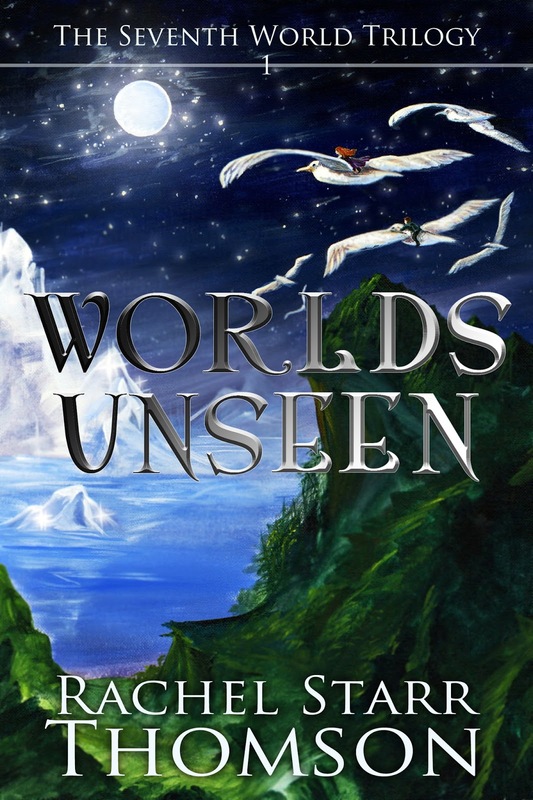 WORLDS UNSEEN is the first book in The Seventh World Trilogy, a Christian fantasy adventure with hints of steampunk and depths of spiritual truth. If you love page-turning action, memorable characters, and inspirational fiction that confronts darkness, reveals breathtaking beauty, and moves your heart to connect more deeply with God, this series is for you. As much as I love physical copies, it's just not possible for me to keep a copy of everything I read in my house. There'd be no room for, well, me! Ebooks take up no room and arrive on my virtual doorstep in no time. Even Amazon prime shipping can't beat that! Get your ebook of Premeditations for your kindle here! This collection of super-short, dark stories of the fantastic make a great addition to your holiday reading to balance out all that sugary food and sappy Christmas music. I mean, I love cookies and singing Jingle Bell Rock as much as the next person, but after the kids go to bed I'll hide in my room, watch The Night Before Christmas, and write you more stories about unicorns that would as soon gore you as not. Watch out cookies, because your god of the all-consuming teeth is real, and I'm coming to get you.